At SB Greenhouses, we believe everyone deserves to experience the joy of growing beautiful, bountiful harvests from their own backyard – and we’re committed to helping each of our customers pursue their passion for home gardening. We’ve been crafting beautiful, highly-effective redwood greenhouses for nearly half a century, and we work with every customer on an individual basis to help them select the ideal DIY greenhouse kit for their unique needs and home environment. 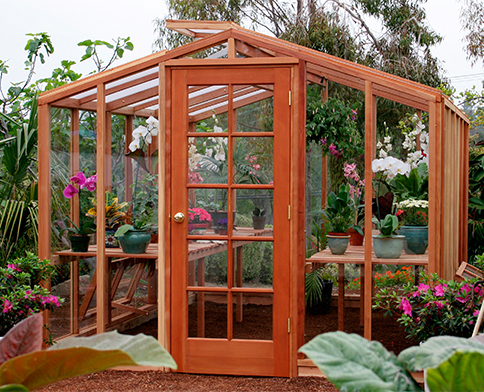 If you’re ready to take your home gardening to an entirely new level, our Deluxe Redwood Greenhouse Kit has everything you need to grow like you never thought possible before. Our Deluxe Model greenhouse kit comes with everything you need to grow beautiful, luscious plants in almost any climate. All of our Deluxe greenhouses come standard with tempered glass sides and fiberglass roofs, striking an ideal balance between insulation and light transmission – or, for even stronger insulation and weather resistance, opt for a double-walled polycarbonate roof or a full polycarbonate greenhouse. Glass and polycarbonate are two of the most popular materials for greenhouse siding, and for good reason. They both offer unique advantages for greenhouse owners, helping plants grow and flourish in their own ways. Glass is the traditional material for greenhouse siding, providing unmatched clarity and light transmission. The clarity allows almost all light to the plants, although this can cause burning in areas where sunlight is particularly strong. Standard greenhouses use 3mm glass, which can cause a breaking hazard – but at SB Greenhouses, we use 3/16″ (4.7mm) thick tempered glass, providing a safe and beautiful material. Polycarbonate is very tough, very durable, and very long-lasting, and our double-wall polycarbonate roofs provide powerful thermal insulation in any climate. Upgrading your greenhouse to a polycarbonate roof or all-polycarbonate construction provides you with a highly insulated greenhouse to grow plants in nearly any climate. At SB Greenhouses, we believe in quality above all else. That’s why countless schools and universities across America trust us to provide greenhouses for their students and why so many of our customers have been thrilled with the quality products and personal care we’ve provided them over our years in business. We use only clear Redwood in our greenhouses, all of which are precision-milled and pre-assembled in our US factory by skilled, dedicated craftsmen. We glaze our panels with 3/16″ thick tempered glass, heavy-duty fiberglass, or double-wall polycarbonate for unmatched durability and efficiency. The result is a high-quality greenhouse with fully-finished panels that are ready for you to bolt together – or, you can save money by opting for a greenhouse kit and doing the easy assembly yourself. In any case, we think you’ll find that our commitment to quality greenhouses and peerless customer service gives you everything you need to grow beautiful, healthy plants from the comfort of your backyard. 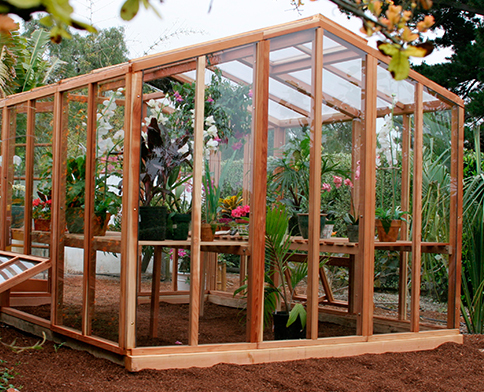 Build Your Own Redwood & Polycarbonate Greenhouse Today! No matter where you are on your journey of home gardening, we have the perfect greenhouse to help you take your gardening to the next level. We take the time to work with our customers individually to help them choose the ideal greenhouse for their unique location and gardening goals, and we instill every greenhouse with the knowledge and lessons we’ve developed over our 44 years in business. For a full list of our Deluxe model pricing and sizes, just browse the table below. Or, if you’d like to own your own greenhouse or find out more about our products, we encourage you to give us a call at 800.544.5276 or order one of our complimentary product catalogs. We hope to hear from you soon, and we’re looking forward to helping you grow your love of home gardening with a beautiful, high-quality greenhouse!